Around the world there are grandparents, parents, and children who can still sing ditties by Tigger or Baloo the Bear or the Seven Dwarves. This staying power and global reach is in large part a testimony to the pizzazz of performers, songwriters, and other creative artists who worked with Walt Disney Records. Mouse Tracks: The Story of Walt Disney Records chronicles for the first time the fifty-year history of the Disney recording companies launched by Walt Disney and Roy Disney in the mid-1950s, when Disneyland Park, Davy Crockett, and the Mickey Mouse Club were taking the world by storm. The book provides a perspective on all-time Disney favorites and features anecdotes, reminiscences, and biographies of the artists who brought Disney magic to audio. Authors Tim Hollis and Greg Ehrbar go behind the scenes at the Walt Disney Studios and discover that in the early days Walt Disney and Roy Disney resisted going into the record business before the success of "The Ballad of Davy Crockett" ignited the in-house label. 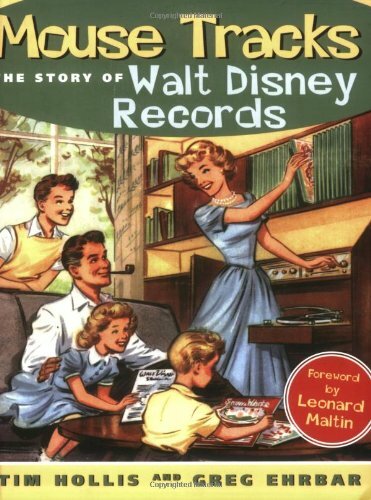 Along the way, the book traces the recording adventures of such Disney favorites as Mickey Mouse, Donald Duck, Cinderella, Bambi, Jiminy Cricket, Winnie the Pooh, and even Walt Disney himself. Mouse Tracks reveals the struggles, major successes, and occasional misfires. Included are impressions and details of teen-pop princesses Annette Funicello and Hayley Mills, the Mary Poppins phenomenon, a Disney-style "British Invasion," and a low period when sagging sales forced Walt Disney to suggest closing the division down. Complementing each chapter are brief performer biographies, reproductions of album covers and art, and facsimiles of related promotional material. Mouse Tracks is a collector's bonanza of information on this little-analyzed side of the Disney empire. Learn more about the book and the authors at www.mousetracksonline.com.